Radha Sagar is a M Town and Marathi TV actress who was born and brought up in Pune. She was born on 27th May 1989 in Pune. She did her schooling from MIT School Pune, while completed her graduation in Commercial Arts from Abhinav Kala Mahavidyalaya. She was very much fond of working in different plays and therefore worked had in mind to act in TV and films since her childhood. She is married to her friend and co-actor Sagar Kulkarni after seeing him for few years. During her college days she was connected with a couple of theatre groups and thus did a few plays as well, which include Ghashiram Kotwal, Aai Retire Hotiye, Aati Rahengi Baharein and Athrava Unta to name a few. Her first break in TV was in Ek Mohor Abol, which was aired at Zee Marathi. Since then it was no looking back for her. 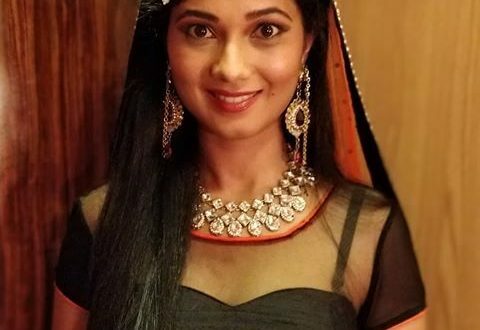 Some of her TV shows include Kanyadan (Zee Marathi), Jayostute (Star Pravah), Jayostute (Star Pravah), Ek Mohor Abol )Colors Marathi), Lakshya (Star Pravah), Asmita (Zee Marathi), Aawaaj (Colors Marathi), and Chahool (Colors Marathi). Some of her recent TV shows include Jayostute (Star Pravah), Ek Mohor Abol (Colors Marathi), Lakshya (Star Pravah), and Asmita (Zee Marathi) to name a few. She got her break in M Town with films like Bhirkit, Ekk Albela, Naati – Khel, Vazandar, Conditions Apply, and FU. Besides, the M Town films and TV shows, she did a couple of other things as well, which include anchoring the promotion event of the film Pyar Wali Love Story of Sanjay Jadhav and Suresh Pai film Classmates. She is one of the contestants in the seven in the Reality Show called “9x Zakaas-Heroine Contest. She also anchored the award show called Salam Pune from Growing Actress, and Pune Festival as well. Besides, she also choreographed one song in the movie “Mukkam Post Dhanori”. She appeared in one commercial Ad for the Buldhana Urban Bank, while was the part of the short movie called Phir Zindagi, which was directed by Sunil Sukhtankar and Sumitra Bhave. She bagged the International Golden Gate Award in the US for her debut movie Nati Khel, which was released in March 2018. Next अभय महाजन आणि दिप्ती सती आहेत संजय जाधव ह्यांचे ‘लकी’ कलाकार !